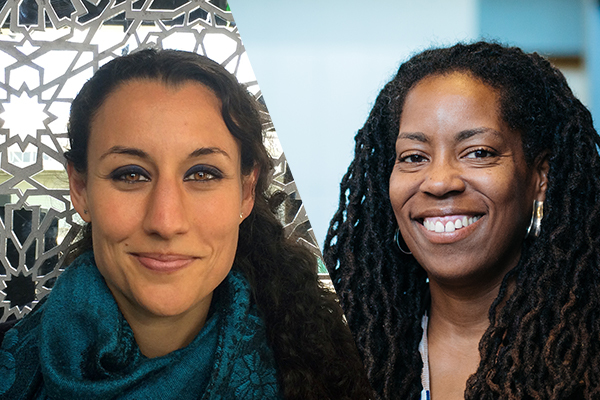 School of Education and Social Policy (SESP) learning scientists Shirin Vossoughi and Nichole Pinkard have received 2017-18 Daniel I. Linzer Grants for Innovation in Diversity and Equity from the Northwestern University Office of the Provost. Both projects reflect a core value of the School of Education and Social Policy: two-way collaborations with neighboring communities, including Chicago and Evanston. Vossoughi and SESP undergraduate April-Alexis Navarro will use the grant to help support a cross-generational academic summer mentorship program that they are developing with Alejandro Carrión, assistant professor of teaching and learning in Latina and Latino studies in the Weinberg College of Arts and Sciences. Navarro is the undergraduate representative of Northwestern University’s Borders and Identities Youth Participatory Action Research Collaborative. The project, called Borders & Identities: (Re)Imagining Our City Through Critical Youth Research,” will bring together Northwestern faculty with three key audiences; undergraduates, graduates, and Chicago Public Schools high school students who identify as low-income and first-generation students of color. “Projects like these creating settings where high school, undergraduate, graduate students, and professors can work side-by-side to conduct community-based research that critically analyzes and re-imagines how cities like Chicago are organized,” Vossoughi said. For Navarro, the research approach will allow her to dig deeper than ever. Pinkard’s diversity grant will help create Black Men LEAD, a student-driven conference that brings together black male undergraduate students from Northwestern and high school students from Evanston Township High School and focuses on shared scholarship, interest, challenges, and opportunities. Students will research, design and co-lead the conference, which is a joint effort between Pinkard, associate professor of learning sciences; Alan Anderson, executive director of neighborhood and community relations at Northwestern; and Marcus Campbell, assistant superintendent and principal of Evanston Township High School District 202. Black Men LEAD is facilitated and supported by the Northwestern University – Evanston Township High School Partnership Office and the Martin Family Fund of Evanston. The Linzer Grants and Awards aim to build a more diverse, inclusive and equitable climate on campus. Since their inception in 2017, the grants and awards have provided nearly $350,000 to initiatives that enhance diversity across the spectrum, including race, gender, religion, socioeconomic status, age and political affiliation. Last year, SESP faculty members Regina Lopata Logan, Marcelo Worsley and Elizabeth Gerber received Faculty Innovation in Diversity and Equity grants. The Provost Awards and Provost Grants are given annually. The award nomination and grant application processes for 2018-19 will be announced on the Office of the Provost website during spring quarter.